Sitting at Café Runam nestled on one of the busiest street corners of Ho Chi Minh City, I curiously perused Ray Dalio’s new book, titled: Big Debt Crises. Ray Dalio is probably one of the most successful money managers of his generation, and his new book does a fantastic job of explaining how debt cycles work. It was a surprise to me to find how closely our ideas aligned, as Dalio’s writings confirm many of my views about the relationship between economic growth and debt increase. Dalio’s ideas are in-line with results from our Asian Capital Development Model (ACD), a proprietary model I’ve developed while investing extensively in Asian markets for the last 12 years. The only difference is his materials only cover the technical parts of debt cycles and how they work, while my ACD Model goes one step further: It highlights which sectors and stocks to invest in. In many Asian and developing countries, the separation of power between the central bank and the state is rarely enforced. This allows Asian governments, in countries like China and Vietnam, to influence their economies by directing banks to both inject credit with low interest rates into favored sectors and to withdraw liquidity from bad performers. This creates and ends debt cycles. Dalio understands this, as governments set the rules that influence both creditors and debtors. As the size of debts become too large relative to the supply of money available in the economy, deleveraging occurs and the government steps in to redistribute spending and wealth, with central banks becoming lenders of last resort. Credit creation leads to more spending power and investments, in turn supporting revenue growth. Dalio calls this period of economic growth the “Goldilocks” period. At One Road Research, we have seen this point clearly, as our ACD model specifically tracks the “Goldilocks” period in countries such as China, a country which used this tactic to sustain double digit growth in the last two decades. The velocity of money is one of the most important indicators to track, as equity markets tend to rise with the rate of debt growth. As a debt cycle begins, the rise of debt and income, combined with a strong stock market, encourages investing — often with borrowed money. As rising incomes make it easier to service debts, the private sector, government, and banks start to borrow. These strong fundamentals and early leveraging-up create the framework for a boom, which in turn attracts even more capital, making the country in question’s stock market even stronger. ACD specifically tracks this flow of debt and debt growth in an economy. This back-tested strategy has proven successful, earning 200-300% from 2009 to 2017 and outperforming the MSCI AC Asia Pacific Index by two multiples. It swings. In the initial phase of the debt cycle, debts increase via cheap credit injections and ultra-low interest rates set by the central banks. Once this debt growth exceeds income growth and the productivity of debt decreases — or even worse, firms starts to default on their loans and debt obligations — a deleveraging phase will occur. Understanding the nature of debt cycles allows us to profit from the stock market’s booms and busts. In ACD, we track the starting points of bull markets via increases in debt, which provides economic incentives to expand and invest in business growth. But the ACD model goes even one step further, looking at the productivity of debt in order to pin-point an exit point. Over time, bull markets tend to become bubbles, as the growth rate becomes unsustainable and late-comers looking for high returns enter a hot market that has shown large gains over an extended period of time. As the bubble bursts, those who arrive late in the debt cycle, will surely suffer most of its consequences. Therefore, a timely investment exit (and entrance, for that matter) is a very crucial skill that separates winners from losers in investing in Asia. 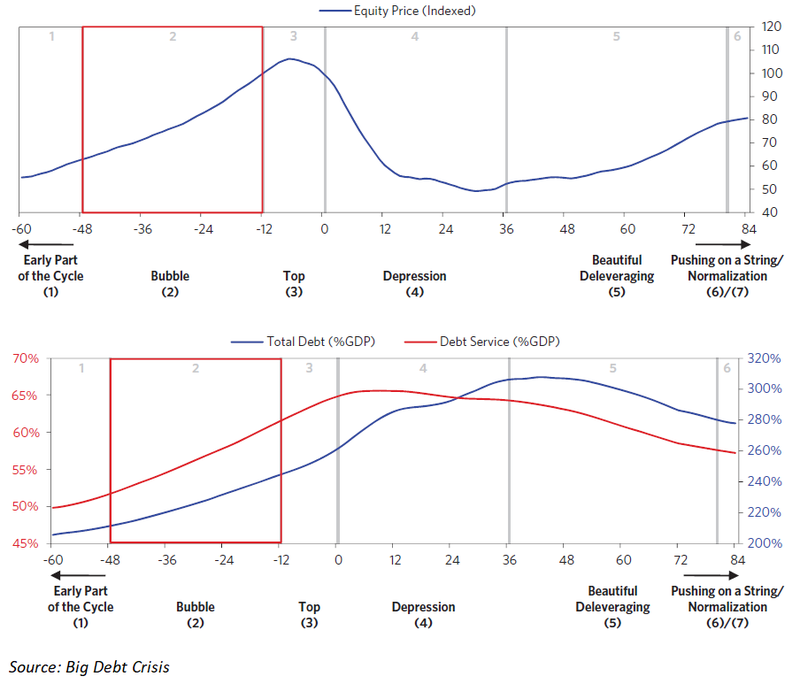 Dalio and I both agree on the major role that credits and debt plays in the equity market boom and bust cycle. It is the literal fuel that drives economic growth. I think we may be on to something big here. As investors, having knowledge is great but isn’t enough; we are better off seeking ways to profit from our information. The best way to do so? Create and maintain tools that allows us to best apply our perspective. So, our ACD model provides the second missing piece to Dalio’s informative book, which answers in detail “the What” but fails to provide “the How”.